Wild bolete mushrooms can be found in the summer and in the fall, usually under pine trees. They have been described as looking like a “hamburger bun on a stick.” If any of the pores are red or orange, do not eat them. If there is a slimy coating on the cap remove the slime by peeling it off. Failure to follow these precautions can result in a severe intestinal upset. 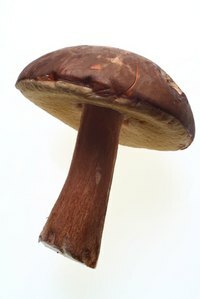 The taste of boletes varies depending on where they are grown so take a small pinch from the cap and discard it if it has a bitter taste. Clean your boletes thoroughly as they are a common home for bugs. Use a damp cloth and no more water than absolutely necessary to remove small bugs and dirt. Boletes are porous and will absorb the moisture. Cut off any dark spots and inspect the underside of the cap for worm holes. Cut off any dark spots. Inspect the underside of the cap for worm holes. Break off the stems and chop them into small pieces. These are a tasty addition to soups, stews or salads. Slice the caps for frying or broiling. Add enough butter to a pan to cover the bottom when melted. Add seasonings to taste. Put boletes in the pan with the butter. Sear quickly to seal in the moisture. Remove the mushrooms and add to them the top of a casserole or eat as a filling in a vegetarian sandwich. They are also tasty added to a risotto. Coat the boletes in oil. Olive, peanut or sesame oil add flavor to the mushrooms. Sprinkle the mushrooms with seasonings. Stir them gently to coat. Broil the boletes in a 500 degree oven on a baking pan until they are cooked through and slightly browned. Watch them closely so they do not burn. The length of the cooking time varies depending on the thickness of the slices. Serve the boletes as a side dish or add them to a salad.